Have you ever considered something different for your next corporate event, fundraiser or just for fun party with friends? 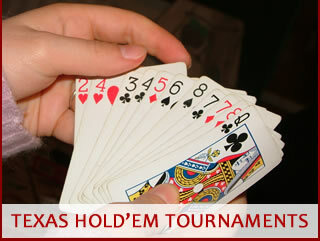 Why not host a Texas Hold’em Tournament???? Casino Parties and More can help you organize a tournament for as little as 10 people or as large as 200 people. Upon arriving, your guests will be assigned a table and seat. At the table, the dealer will direct them to their seat and give the players their starting chips. Once everyone is seated, the tournament director will announce “Shuffle up and deal”. Each player receives an equal amount of chips. There will be a small blind and a big blind each hand. As play progresses, the amount of the blinds increase. The tournament director will customize the blind amounts based on the number of players and the length of the event. Most events are scheduled for three hours, but some events may last longer. Tables- We use high quality Texas Hold’em tables made with professional felt used in many casinos. Our tables seat 10 players plus the dealer. Casino Parties and More only supplies the tables. The client will need to supply 11 chairs per table or chairs can be provided at a mimimal cost. Tournament Director – For every tournament, we will provide a tournament director. The tournament director is in charge of setting the blinds and moving players to different tables as players are eliminated. The director abides by the same tournament rules used in many of the large professional tournaments seen on television. Dealers – All of our dealers are attired in tuxedo shirts, black bow ties, and black pants. They are fully trained to make sure the event runs smoothly. Tournament Software – We use tournament software to track the play, blind levels, and tournament clock. We can also provide a projection system for larger events to display the information on a screen so players will be informed about the play. You may also consider adding additional casino tables to your tournament. Adding blackjack, craps, or roulette tables will give your eliminated players other things to do for the remainder of your party. Please call us to request a quote. We will be glad to put together a customized quote for your event.